Fee's Little Craft Studio: Do You Feel Like A Weekend Away? Do you feel like you need a little break? 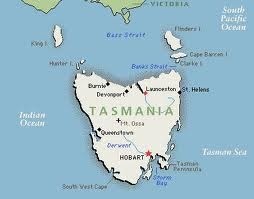 Why not join us for our wonderful weekend in March in Tasmania my home state. It is just 39 sleeps until it begins. Bookings will close on 14th February to allow for our final preparations. I have seen some of the projects that the girls have in store for you - You are going to love it all so much. Our Sunday Sewing Day will include "Live" demonstrations on quilting and stitching techniques from 6 Designers and of course some retail therapy. Thank you for the e-mails and lovely comments on my little keyrings. To answer some of the questions asked there is no pattern for these - I simply cut 2 x 2 1/2" circles (on my Go Baby) from wool or wool felt. Sewed a button on the front. Attached the ribbon and ring to the inside of the front circle behind the button to hide the stitches﻿ and then blanket stitched the front and back together and put a little bit of stuffing inside. Feel free to use my idea any way you wish - That's the beauty of creation and little ideas - The sharing of them. Sounds like it will be wonderful.